Hip In Detroit: The Warm Way to Experience The Thanksgiving Day Parade! The Warm Way to Experience The Thanksgiving Day Parade! Thanksgiving is this week, which means so is the Thanksgiving Day Parade in Detroit. Although waking up at the crack of dawn and sitting along Woodward in 20 degree weather sounds like a blast, we have a better idea we'd like to suggest. This year, head to the Majestic for Thanksgiving! 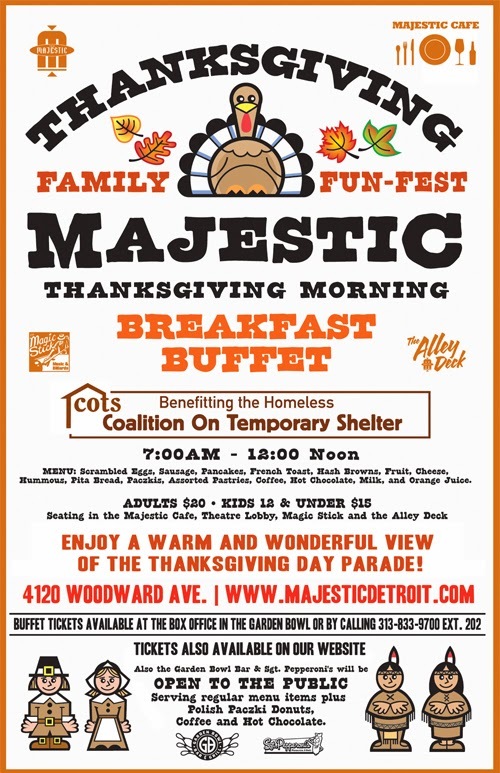 The Majestic Complex (The Majestic Cafe, Theatre, Garden Bowl, and Magic Stick) is hosting their Thanksgiving Family Fun Fest this Thursday morning. The event features an awesome Breakfast Buffet and a great view of the parade staging area. That means all of the floats, bands, and celebrities will be getting ready right outside and you can see the parade before everyone else down the road! Not to mention, it should be a lot warmer and cozier inside the Majestic and they have plenty of windows you can look out. 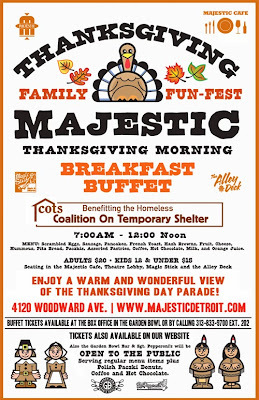 Tickets for Thanksgiving Breakfast at the Majestic are $20 for adults and $15 for kids 12 and under. As with all Majestic events, tickets are available at the Garden Bowl fee free. The fun starts at 7 a.m. and runs until Noon, with the parade officially stepping off at 8:45 a.m. Proceeds from this event will benefit the Coalition on Temporary Shelter. For further details and a list of all the tasty food that will be available, click here.